Northern Colorado is the name for a region in the state of Colorado and a proposed state in the northeastern portion of Colorado. 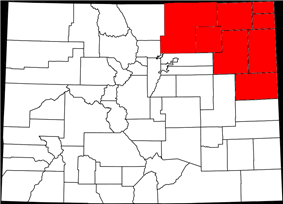 Northern Colorado is a region in the northern portion of Colorado. It borders northwestern Colorado, northeastern Colorado, the northern portion of Central Colorado, western and southwestern portions of Nebraska, and the southeastern portion of Wyoming. Northern Colorado receives over 300 days of sunshine per year and has a Semi-arid climate. However, the parts located in upper elevations of the Rocky Mountains receive 300 inches (760 cm) of snow per year and have an Alpine climate. The University of Colorado Boulder, Colorado State University, and the University of Northern Colorado are all located in Northern Colorado. Counties involved in the proposed state of North Colorado. North Colorado or Northern Colorado is a proposed new U.S. state which would consist of several counties in the northeast portion of Colorado and possible counties from Nebraska and Kansas. A University of Colorado law professor has indicated that an additional step would be required beyond the approval of the state legislature and the U.S. Congress as the Colorado Constitution defines the state’s boundaries, thus requiring a vote on a constitutional amendment. A County Commissioner of Weld County stated his belief that the county sends more oil and gas revenue to the state than it receives back for schools, roads, and other services. In 2013 the Democratic-controlled Colorado General Assembly passed tighter gun control laws, higher renewable energy reliance laws, and livestock treatment laws. A higher environmental standard oil and gas production law was narrowly defeated. During the debates over these laws, talk of secession began in the Eastern Plains area. At a meeting of the state's county commissioners in early June, a State House leader indicated that they would attempt to pass the oil environmental standards law again. This brought the secession discussion to a higher level with Weld County Commissioners Mike Freeman, Sean Conway, and Douglas Rademacher leading the proposal with a hearing scheduled regarding counties placing secession questions on the November 2013 ballot. Eleven counties asked voters if they supported seceding from Colorado. Counties shown in orange voted in favor of secession; counties shown in blue voted against. Along with Logan, Sedgwick, Phillips, Washington, Yuma, and Kit Carson. Also interested in joining the new state are parts of Nebraska. Colorado's Eastern Plain counties all may possibly be involved in the split, but Larimer County Commissioners indicated that their county would not likely approve of a split. On July 8, 2013 a meeting of representatives from 10 counties was held in Kansas counties also wish to join in forming the state. The county commissioners involved discussed an alternative plan if breaking away is not feasible. This alternative would be to change the Colorado Constitution to have one state senator per county; however, the U. S. Supreme Court invalidated such representation by county in Reynolds v. Sims (1964) as a violation of the one man, one vote principle. Cheyenne County – outside of the original proposed area – became the first county to refer the measure to the people on July 23, 2013. A total of eleven counties placed the measure on the November 5, 2013, ballot. Voters in Cheyenne, Kit Carson, Phillips, Washington, and Yuma counties approved the measure. ^ "Several counties want to secede from Colorado". CBS News. June 9, 2013. Retrieved 9 June 2013. ^ Wiersema, Alisa (June 7, 2013). "Northeast Colo. Wants to Be Separate State". ABC News. Retrieved June 9, 2013. ^ a b c "Secession Plan Floated By Some Northern Colorado Leaders". ^ a b Boyd, Shaun (July 9, 2013). "Effort To Create New State Called ‘North Colorado’ Grows". ^ a b Malone, Patrick (June 6, 2013). "Rural Colorado counties propose 51st state". Coloradoan. Retrieved 9 June 2013. ^ Brachfeld, Aaron (24 July 2013). "Cheyenne County votes secession, Eastern Co to follow?". the Meadowlark Herald. Retrieved 28 July 2013. ^ Barabak, Mark Z. September 22, 2013. Secession drive gathers steam in rural Colorado. Los Angeles Times. Accessed on September 23, 2013. ^ , 5 November 2013The Denver PostWhaley, Monty. "51st state question answered "yes" in 6 of 11 counties contemplating secession," , accessed 6 November 2013. ^ Status of My County. 51st State Initiative. Accessed on September 23, 2013.